This meal, back in November of this year, was simply one of the best of my life. 1WineDude blogged about the wines we drank here.THANK YOU, again, Paolo! I love you, man! 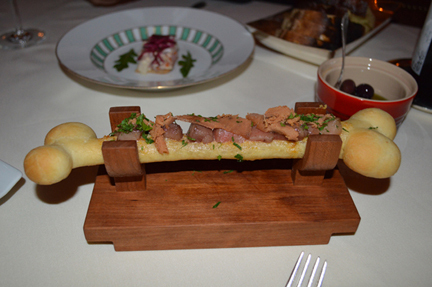 Above: Marrow served atop a bread “bone” and sprinkled with bottarga. The food at Vetri in Philadelphia is simply breathtaking. I had the great fortune to dine there last night with my great friend and client Paolo Cantele (and I’ve just posted food photos on his blog CanteleUSA). 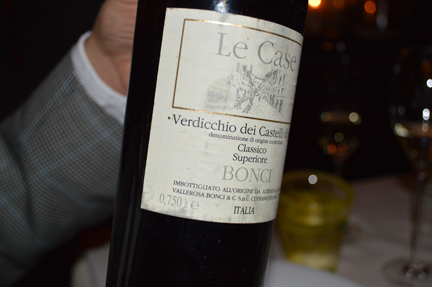 There were many extraordinary wines poured last night but the one I can’t stop thinking about was the Bonci 1998 Verdicchio dei Castelli di Jesi, selected by my friend Steve Wildy, the restaurant’s wine director (one of the sweetest and most gifted people in the trade). 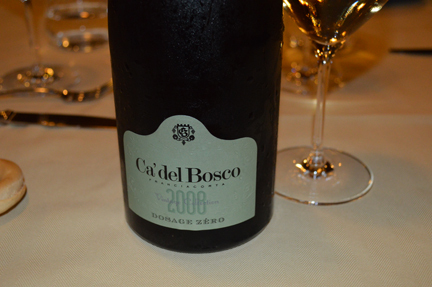 This fifteen-year-old expression of Verdicchio seems to be drinking at its peak (and perhaps has more years ahead of it): rich and complex, it was such a great example of an indigenous Italian grape (one of the few) that benefits from small-cask aging. It was a brilliant choice by our sommelier and I loved its unctuous mouthfeel. But the most extraordinary thing was how the staff — front and back of the house — literally danced around us. 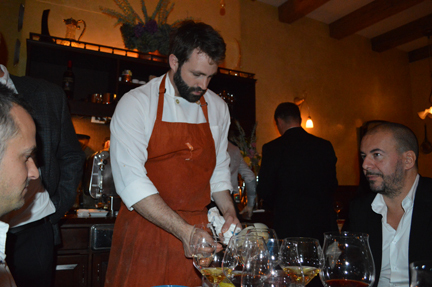 That’s chef de cuisine Adam Leonti (above). When he saw that we tasted a Lazio wine (among the many wines we were served), he whipped up some pajata, a dish in which the digested mother’s milk of a calf is cooked in its small intestines, a classic of Roman cookery (he didn’t know that I am a huge fan of the dish and have written about it on many occasions). 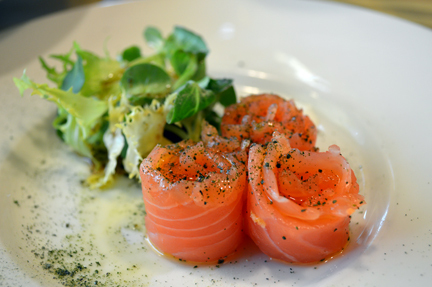 Check out the other food photos on Paolo’s blog. 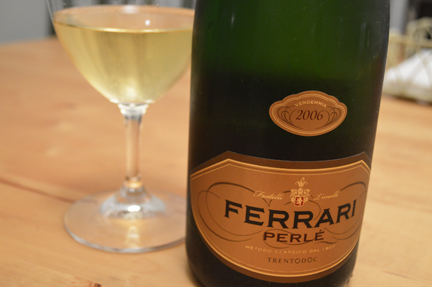 Click here for my Houston Press Champagne and sparkling New Year’s eve recommendations. I had so many extraordinary meals this year at my friend and client Tony’s restaurants this year. But this repast at his flagship Tony’s in October was a poetica of elegant and thoughtful cookery and it’s one of my #BestMeals2013. 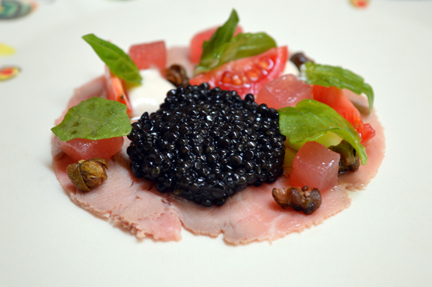 The “tonnato”: thinly sliced roast veal breast garnished with caviar, raw tuna, fried capers and an ethereal aioli. 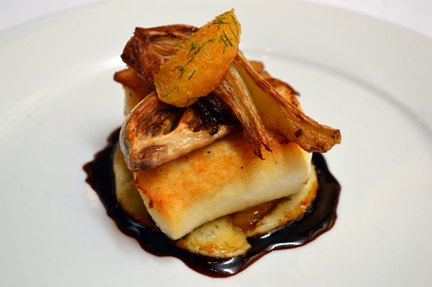 Atlantic halibut with braised fennel and orange and fennel “confit” over a Barolo reduction. 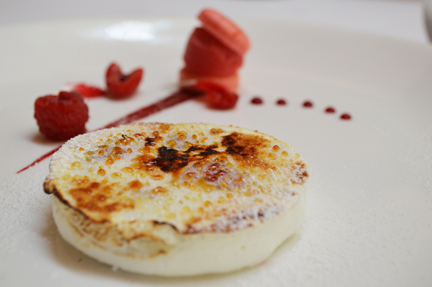 Meringue stuffed with fresh raspberries. 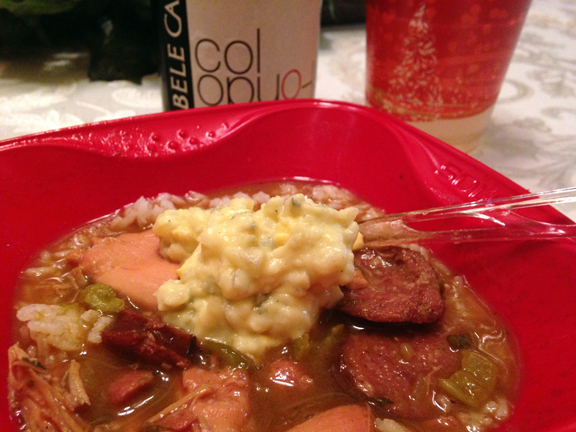 Bele Casel Prosecco Colfòndo isn’t “officially” available in Texas, but we managed to sneak some in for Christmas eve on the bayou and paired it with Uncle Tim’s east Texas gumbo. For those of you who’ve never had gumbo, it’s a stew made with roux, filé (finely ground sassafras), and meat and/or seafood, and often served over steamed rice. Uncle Tim makes his Christmas eve gumbo with chicken and deer sausage. In classic east Texas fashion, he recommends folding in a generous dollop of his potato salad (made with hard-boiled eggs). 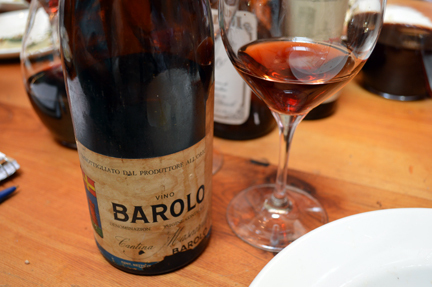 Bartolo Mascarello 1958 Barolo, a holy grail of wines for me. If ever there were a wine that embodied the “unbearable lightness” of Nebbiolo, this would be it. 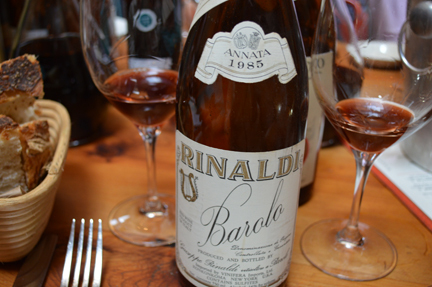 A wine from an extraordinary vintage in Langa and an apotheosis of Barolo. One of the most remarkable wines I have ever tasted — perhaps the greatest. fetish, “an inanimate object worshipped by preliterate peoples on account of its supposed inherent magical powers, or as being animated by a spirit [Oxford English Dictionary],” from the Latin factīcĭus meaning factitious (made by or resulting from art). 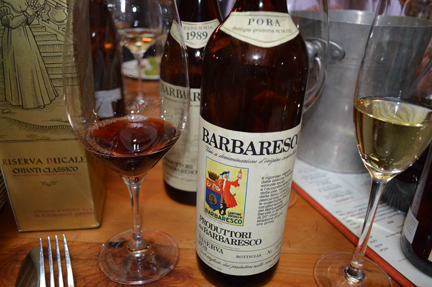 Everyone agreed that the Bartolo Mascarello 1980 Barolo was a standout in the flight. It had that electric vibrancy and magnetic focus in its rich, dark fruit. 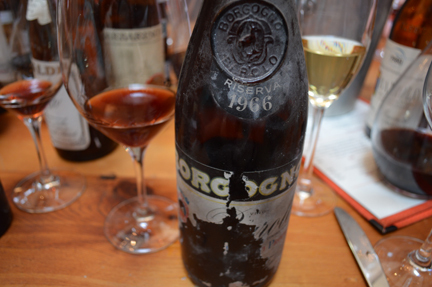 Wow, what a wine this was… 1980 is regarded as a fair to poor vintage in Langa and this wine was a great example of how great winemakers can deliver outstanding wines even in challenging vintages. Dayenu! If only just one of the bottles in the flight had been opened over lunch at Il Buco Alimentari e Vineria in lower Manhattan, it would have sufficed to satiate our Nebbiolo fetish! On Friday, I had the immense fortune to be invited to a meal and tasting by Nebbiolo connoisseur and Langa chronicler Ken Vastola (check out his amazing blog). Even though we’d never met in person, I’ve known Ken for many years virtually: we follow each other on social media and often exchange notes and information about the winemakers we both follow (remember this post on the origins of the term piè franco that I wrote a few weeks ago inspired by Ken?). We’d been trying to get together for some time now. But the fact that I no longer live in NYC and he lives outside the city have made it tricky to make our schedules and travels align. But on Friday, the stars smiled upon me: Ken invited me to join him and his regular group of collectors and Nebbiolo fetishists. 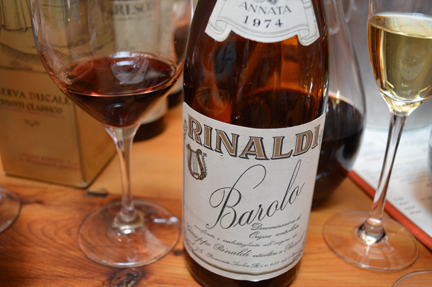 A great wine from a good (but not great) vintage, the Giuseppe Rinaldi 1974 Barolo was in the late fall of its evolution, with an ethereal lightness of nuanced fruit. One of my personal favorites, although not the best of the best. Fetishists, you ask? No, I’m not referring to the colloquial usage of the term fetish. There was nothing sexual or otherwise titillating about our lunch and tasting. I’m talking about the way that Nebbiolo from Langa often assumes a a cultish and even spiritual significance among collectors and connoisseurs (the same way high-profile restaurateurs and top-spending diners often fetishize beef in our country). 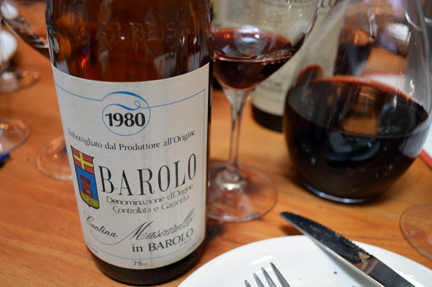 Like the 1980 Mascarello Barolo, this wine was stunning for its vibrancy and richness. The Pora cru tends to be generous with its fruit in the wine’s early years. 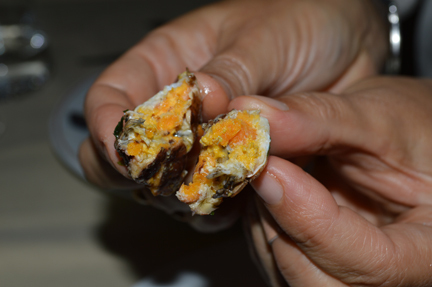 And this was a illustrative example of how Pora retains that brilliance of fruit even as it evolves. 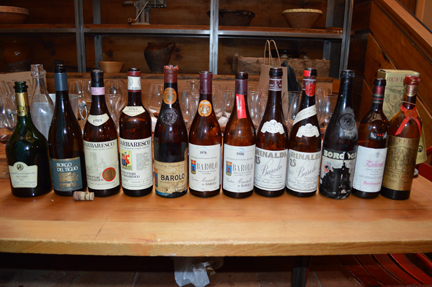 I think that all agreed that this, the 80 Mascarello, and the 58 Mascarello were the top wines in the flight. After all, between the eight persons in attendance, we could have never consumed all the superb wine on the table before us. Much of the wine was left over — a libatio, a drink-offering, a “pouring out of wine or other liquid in honour of a god” (OED). In fact, the purpose of the gathering wasn’t to nourish ourselves or to employ or apply the wines as they had been conceived — as nutrients themselves, an accompaniment and complement to food. Instead, we were there to worship these wonderful, wonderful wines. And before us, my generous hosts had erected a temple that literally overflowed with rare treasure and religious artifacts. Over the last decade, shiny library-release bottles of old-vintage (topped-off?) Borgogno have made their way to the U.S. market. I was thrilled to taste an original release from the 1966 vintage and was impressed by how fresh and lively this wine was. A personal stand-out for me. For me, such an opportunity is golden. Although I do collect wine and have a nice library of twenty or so cases of Nebbiolo, I rarely get to taste old vintages of top wines like this. And I am humbly and eternally grateful to the whole group — Marc, Frank, Jamie, Carl, Joe, and Ken (in the order that they sat at the table) — for its extreme generosity. Guys, I can’t thank you enough for inviting me to “pray” with you. And Ken, as much as the wine thrilled my senses and my mind, the best part was gleaning your insights on Nebbiolo, Langa, and the people who produce (and who have historically produced) these wines. You are a rabbi in my world and anytime you need me for a minyan, I am available to daven on the bema of the Langa hills. One of the most remarkable flights of wine I’ve ever seen before me. Other highlights were Taittinger 1995 Comtes de Champagne, Mastroberardino 1968 Taurasi (classic, not single-vineyard designate), and Ruffino 1961 Chianti Classic Riserva (gold label). 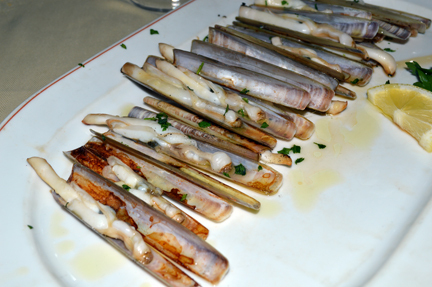 Above: Grissini — bread sticks — are one of Italy’s great gifts to humankind. I’m not talking about the hydrogenated oil-charged grissini that come in a plastic wrapper. 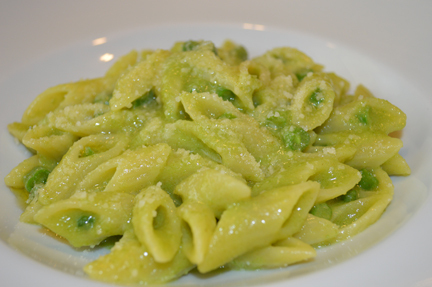 I’m talking about the ones that chefs like the amazing Vittorio Fusari bake in-house. Georgia P couldn’t get enough! Franciacorta Chef Vittorio Fusari and his Dispensa Pani e Vini have become a happy Parzen family obsession. 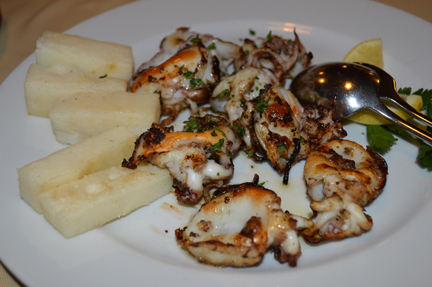 Last week I wrote about the first of two meals we had there earlier this year. Vittorio’s ability to match brilliant technique and precision with his uncanny knack for sourcing wholesome materia prima have fascinated and thrilled me. Bringing Tracie P and Georgia P to lunch there was one of the highlights of our family trip to Italy in the spring. Here’s what we ate on the second day. There is so much great beer being made in Italy right now. 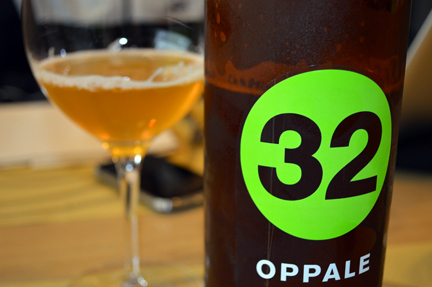 We loved the richness of aroma and flavor in the Oppale by 32 Via dei Birrai. The salmon wasn’t cured. It was served raw, expertly sliced and dressed with a gentle drizzle of olive oil. So simply yet ethereally satisfying. Vittorio made these penne with green beans especially for Georgia P. Mommy and daddy couldn’t help stealing a bite. 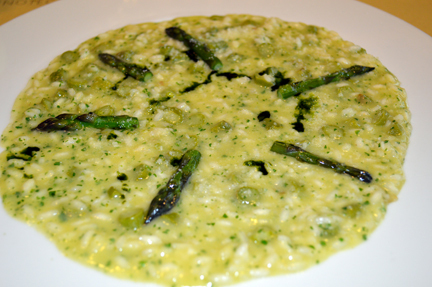 Vittorio’s risotto agli asparagi was a masterpiece. This dish left me speechless. 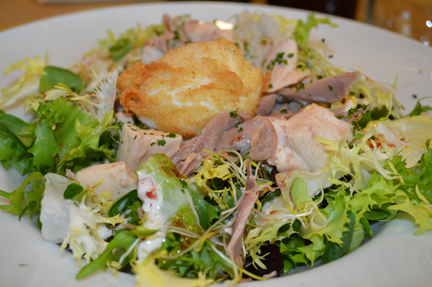 Poached chicken salad. That’s a lightly breaded, fried egg in the middle. It’s yolk was perfectly runny. 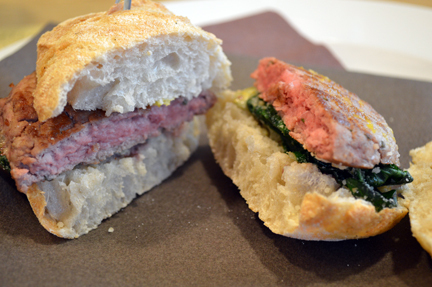 The Bresciani (ethnonym for natives of Brescia, Lombardy, the province that claims Franciacorta) love beef. This was Vittorio’s take on the hamburger. All the bread is baked in-house at the Dispensa. 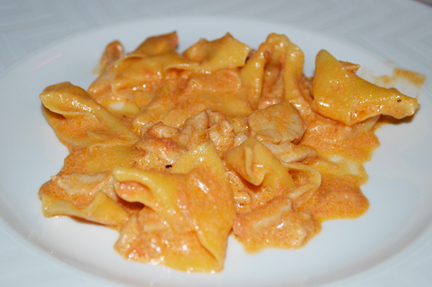 Manzo all’olio — literally “beef cooked in oil” — is a classic dish of Bresciana cuisine. 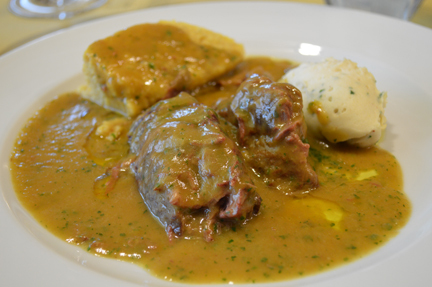 Slowly braised beef usually served with polenta and/or potatoes. 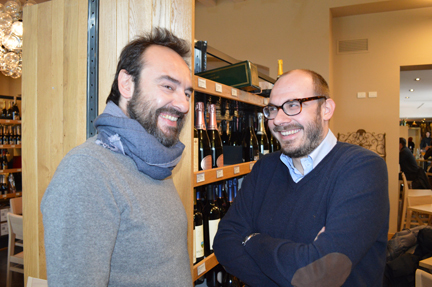 If I’m in Franciacorta, you’ll usually find me in the company of my bromance Giovanni Arcari (left), winemaker extraordinaire and grand personage of Italian wine. He met us for lunch and we bumped into Eugenio Signoroni, editor of the Slow Food beer and osteria guides. That’s the kind of place the Dispensa is. You always run into food and wine professionals and personalities there. 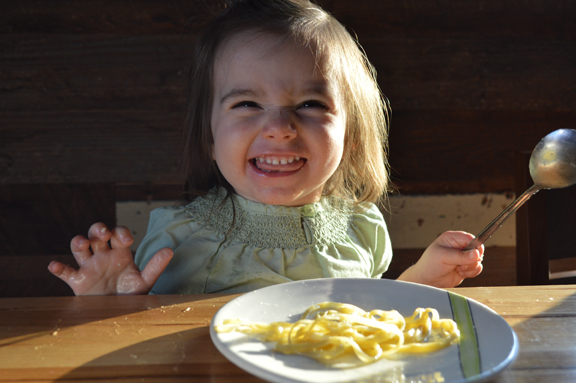 What a joy to watch our sweet baby girl enjoy her meals at the Dispensa. Our family life is centered around eating well (and by “well,” I mean deliciously and wholesomely) and there is no chef I know who devotes more attention and passion to the wholesomeness of what he serves his guests. Thank you, Vittorio! The Parzen family is your unabashedly and eternally devoted and grateful fan! Above: Georgia P (right) just turned two and Lila Jane (left) is nearly five months old. Lila Jane Parzen was born on Monday, July 22. She’s doing great, nursing like a pro and enjoying her big sister’s antics. She’s such an easy baby and such a joy to hold. Georgia P is also doing great. 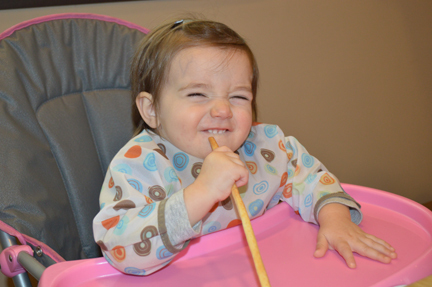 She eats like a champ, now often using a fork, and just loves her pre-school, where she spends two mornings every week. 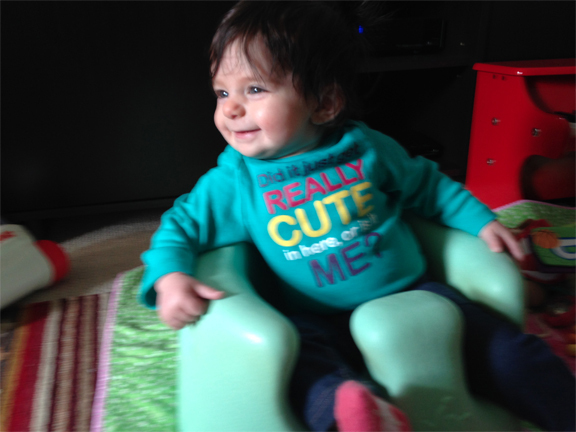 She’s got SO MUCH personality and we’ve been having a blast teaching her new words (yogurt and bagel are recent additions to her vocabulary). Both girls are super sweet and always have a coo, a smile, a laugh, and a hug to share. 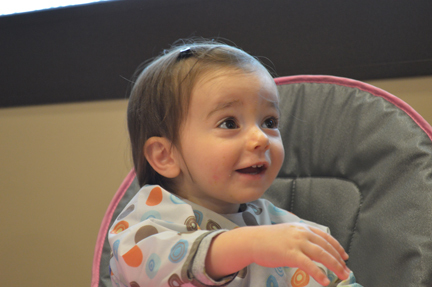 Above: This has got to be my favorite photo of Georgia P. She LOVES going to restaurants and she loves eating. “People let me tell you about her, she’s so much fun…” (sung to the tune of the “Courtship of Eddie’s Father”). 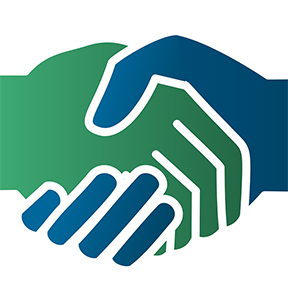 Our social media, editorial, and marketing consulting business has done well again this year. And while we’re not out of the woods yet, there is light at the end of our financial tunnel. We are so fortunate that our business allows Tracie P to be a stay-at-home mom. And there’s no doubt in my mind that the girls get their sweetness from her. Above: Lila Jane’s personality is really starting to show. She’s a very mellow, easy-going child. And, wow, what a head of hair! We know she didn’t get it from her father! The big family news is that we will be moving to Houston in early 2014. 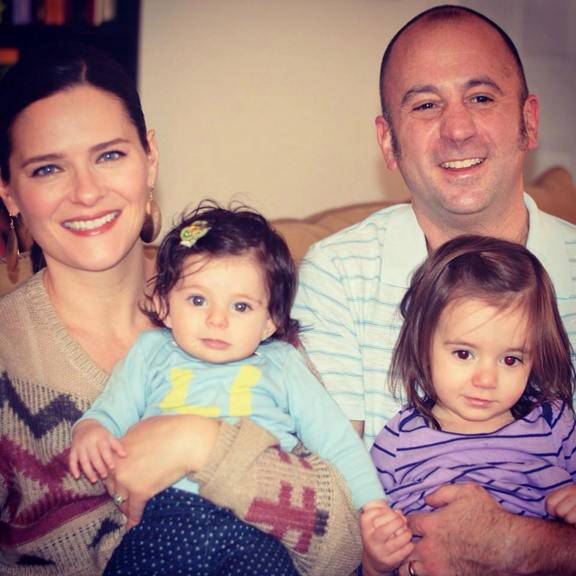 We have loved living in Austin but right now, with a toddler and a newborn in the house, we really need the support of Tracie P’s parents, Rev. and Mrs. B: “bawbaw and nanna” play such an important role in the girls’ lives and with our move, they’ll be just two hours away instead of five (Orange, Texas, where they live and where they raised Tracie P and her sister, lies to the east of Houston). The move will also save me a lot of time and money. I’ve been commuting weekly to Houston for my top client in Texas and our new home there will allow me to spend more time with the girls instead of on the road. And of course, I have family in Houston, too. Cousins Joanne and Marty and Dana and Neil have been so supportive of us in so many ways. We’re looking forward to spending more time with them, as well. Thanks so much to everyone who’s shared our joy with us this year. It means so much to us that you do. There’s so much more to tell about our work, our music, and our dreams and aspirations for the coming year. May G-d bless you all and may your new year be filled with health and happiness. Let’s face it: Champagne is the elephant in the room. Champagne — the wine, the region, the brand, the ethos — is so powerful and so indelibly woven into the fabric of our vinous consciousness that we cannot help but be aware of its presence at the popping of every cork. I believe this is due in part to the brilliant legacy of marketing by Champagne producers. From Champagne’s widowed matriarch to the Czars of Russia and the court of St. James’ and James Bond, the French virtually wrote the book on how luxury wine can be marketed with thrilling results. After Tracie P and I serendipitously discovered this mainland Venice classic earlier this year, Trattoria Nalin meteorically rose to the top of my “favorite restaurants in the world” list. In the fall, on my last trip to Italy for 2013, I managed to break away from work and enjoy a super fun dinner there with my very close and dear friend Steve and Sita (Steve and I were college roomates and we’ve all known each other for more than 25 years). 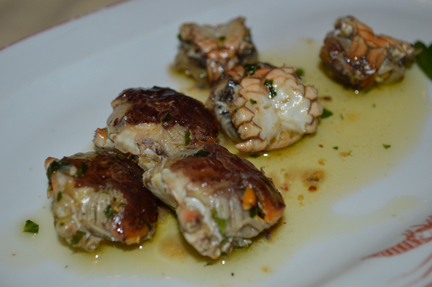 It was early October and a very special time to be there: the sea animals of the Venetian lagoon had just mated and the crustaceans were teeming with roe, called coral in Italian because of its bright red color. Those are the she crabs, above. 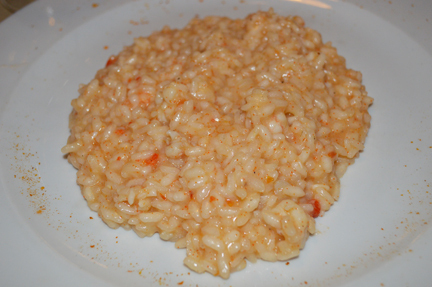 Risotto with prawns. Note the coral that the kitchen used to sprinkle on the rice. Amazing… Did I mention that I love this restaurant? 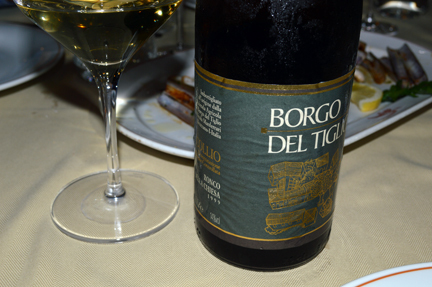 Borgo del Tiglio 1999 Ronco della Chiesa, easily one of the best wines I drank all year. And again, an obscenely low price. Old white wine, when it’s great like this, is one of the greatest pleasure on G-d’s earth… I’ll never forget this bottle and was so glad to share it with people whom I care about so deeply. Nalin’s son told me that he’s sold off a lot of his list but he still has a mini vertical of Borgo del Tiglio. I plan to drink every last bottle. These are game-changing and life-altering wines. 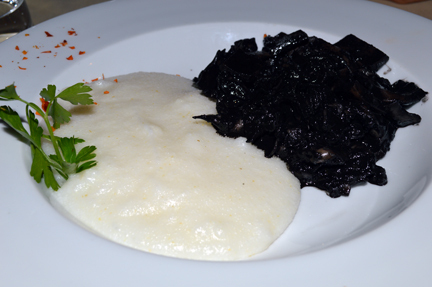 Cuttlefish served in its ink with white polenta. Thank you for letting me share this unforgettable experience with you.